They have green heart shaped leaves. They are commonly referred to as Siberian Bugloss, and because of their flowers as Siberian forget-me-not and forget-me-not anchusa; their leaves give them the other common name of Heartleaf. They make ideal contrasting plants for shady parts of the garden. 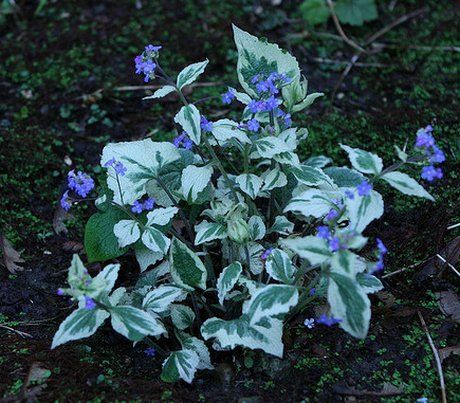 Visit this page for information on how to grow Brunnera macrophylla. Flower Details: Blue, white. Forget-me-not-like. Foliage: Often grown for it’s attractive foliage. Heart-shaped. Variegated. Green. Sow Outside: Cover seed. Late summer or early autumn. Spacing 10 to 20 inches (20 to 40 cm). Sow Inside: Mix seeds in a moist growing medium, place in a freezer bag, then stratify by refrigeration for four weeks. Germination time: one to three months. Temperature 60°F (16°C). Sow out stratified Brunnera seeds ten weeks in advance. Transplant outdoors following the last frost or in autumn. Requirements: Full sunlight or partial shade. Grows in most soils; for best results: Soil pH 5.5 to 7.0, rich soil, moist soil. Regular watering to ensure soil is moist. Regular watering during dry periods. As Brunnera are short lived perennials it is necessary to divide plants in autumn in cool areas, or at the start of spring in warm areas. Propagate: As above. If planning to grow Brunnera outdoors from the off it is best to sow out the seed in the early autumn, simply cover the seeds. 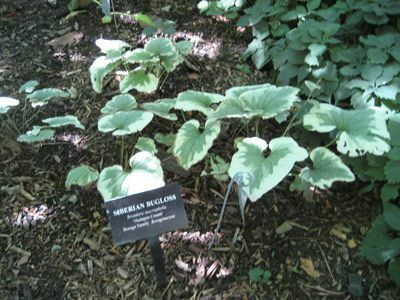 When growing Siberian Bugloss like species indoors first before transplanting seedlings then seeds should be prepared by placing the seeds (within soil) in a black bag, then placing in the fridge for four weeks. Brunnera Seeds should then be sown out at a temperature of 13 to 15 Celsius; they normally take between one and three months to germinate. 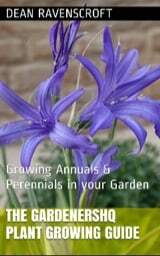 Seedlings should be transplanted following the last frost of spring or in the autumn. seedlings should be planted with a spacing of about 35 cm into a sunny or partially shaded part of the garden which has moist soil with a pH of 5.5 to 7. The plants do not live long and should be divided when they are beginning to show signs that their life is coming to an end.